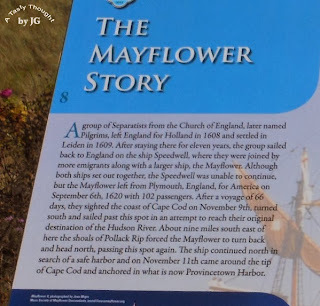 As I prepare for Thanksgiving Day, I always think about the English colonists who sailed across the Atlantic Ocean on the Mayflower. As a resident of Massachusetts I always enjoy driving east to the Cape (Cape Cod) in the warmer weather to enjoy the beaches and also to learn more history whenever possible! There is an area in Chatham, MA across from the Coast Guard Small Boat Station and Chatham Lighthouse that overlooks the Chatham Sandbar. The tranquil scene and lighthouse are a "must see" for many visitors to this area. There are also interesting plaques containing history to read. This is a fascinating story! 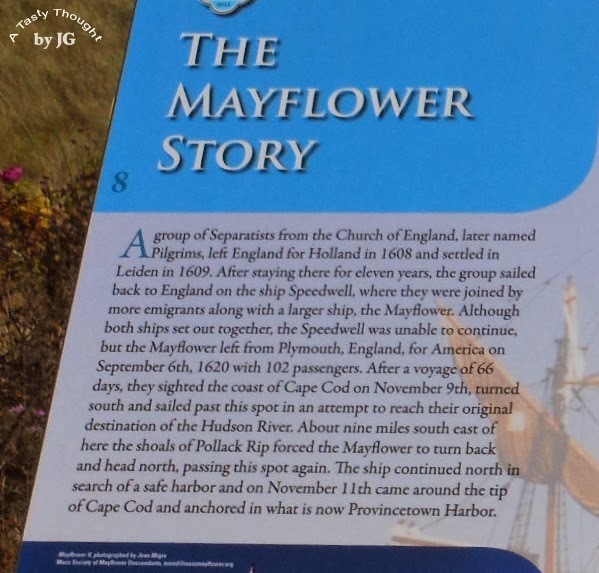 The Pilgrims did not travel directly to Plymouth, MA! Rather than post the images and story again, visit my post from last November and read a bit of History... when you have a chance during this Thanksgiving weekend. 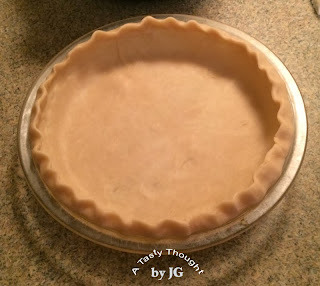 Ready to fill with the Butternut Squash Custard Filling! It has been a month of savoring the taste of Butternut Squash! The delicious orange colored veggie that contains Potassium. One 2 Cup Ziploc Freezer Bag was defrosted in the fridge yesterday and used today. 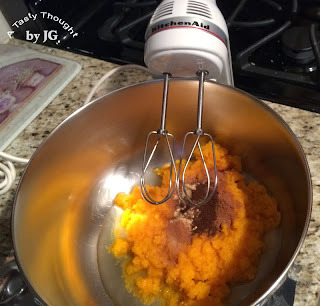 The hand mixer makes it easy! 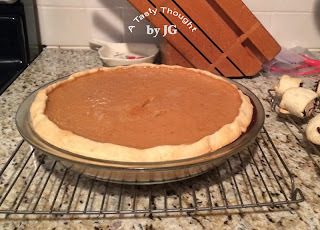 The Butternut Squash Custard Pie (recipe) has been cooling on the rack. Soon it will be placed in the fridge. A serving spoon full of steaming Baked Apple Butternut! A little steaming baked Butternut Squash and a bit of hot Cortland Apple combined on the fork! Oh, yum! I had not baked this side dish in quite a few years. Every year I have good intentions, but all of the purchased Butternuts get steamed/ mashed and then packaged in the Ziploc qt. sized Freezer Bags to enjoy on holidays and during other special dinners during the year. Not this autumn! There were 2 Butternut Squash left in the cardboard carton. I had Cortland Apples. I had plans! The Cornflower CorningWare dish was located and I was good to go! Yes, I still have my treasured Cornflower. They do last a lifetime! The combination of baked Butternut Squash + baked Apples is delicious! Add in the Cinnamon & the Nutmeg - ah, great flavor! In this recipe softened Butter/ Margarine is combined with the spices + a little flour and Brown Sugar. The addition of 1/4 Cup of Craisins or Raisins or a combo of both would be so tasty here and also colorful! However, a baking dish of Apple Crisp with Craisins/ Raisins was in our fridge, so the Craisins & the Raisins did not make the cut here. Before covering with foil & placing in 350°F oven. Spray a 10" x 10" Baking Dish with PAM. Rinse Butternut Squash & Apples under cool running water, dry. Cut off stem & rounded top of Squash, toss. Cut long portion of Squash into slices. Cut off peel. Then cut into 1" chunks. Remove seeds from bottom and cut remaining Squash into pieces. Place Squash chunks/ pieces in Baking Dish. 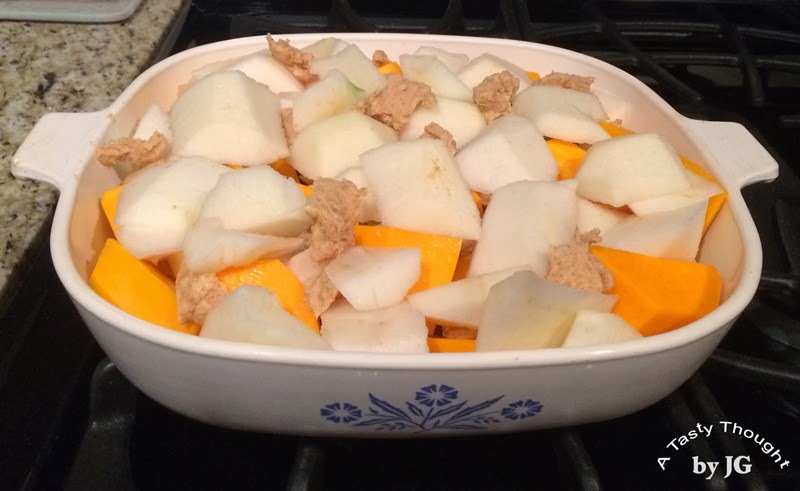 Place Apple slices on top of Squash in Baking Dish. In small bowl, combine remaining ingredients for topping. Place topping on Apple Slices. Bake in preheated 350°F oven for 60- 70 minutes, or until Squash chunks are tender. Use fork to pierce. 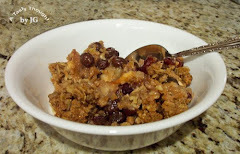 ***If adding 1/4 cup Craisins/ Raisins, add on top of Butternut Squash Chunks/ Pieces, after Step #7. This is a yummy side dish! The flavors blend well together. After our dinner, the extra portions were packed in Ziploc Freezer containers/ labelled and into our freezer they went. What a welcome surprise at dinner this will be on a cold windy bleak winter New England night! Do you serve Butternut Squash? It's always on our Thanksgiving Day Dinner table! This weekend I'll be baking the Yummy Apple Breads and freezing them! This week we had a couple of days that were cold. They were dreary, too. They also contained the sound of "achoo" from me. Wednesday evening an easy meal to prep at dinner was needed. Hot soup with a Grilled Cheese Sandwich sounded really good! Plain, simple, good! All of the ingredients for Tomato Basil White Bean Soup (recipe here) were found quickly. As some of the ingredients including canned plum tomatoes cut in pieces, chicken broth, tomato sauce, Basil & Garlic Powder were simmering, my griddle pan was located. Grilled Cheese on oatmeal bread is a fave here & sometimes I add tuna when making it - before grilling. For a number of years, tuna packed in olive oil is our preferred choice. Some of the oil is drained from the can, before mashing the tuna. I skip adding the mayo here and just add the tuna into a sandwich. Quite often when turning a Grilled Cheese n Tuna Sandwich over while grilling, a little tuna sneaks out onto my griddle. No longer will that happen! The magic? Add a little shredded cheese into the mashed tuna before placing it on the bread slice. The shredded cheese heats, melts and keeps the tuna together. It's also a little extra cheese in the Grilled Cheese n Tuna Sandwich. What a great taste! 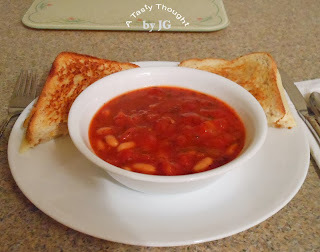 It was so good along with the Tomato Basil White Bean Soup! It was also very easy! The Butternut Squash was in the fridge ready to use. 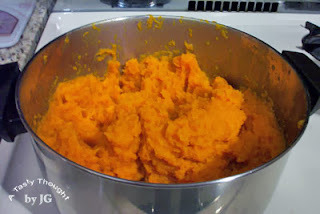 I'd saved 2 cups of the freshly mashed veggie to bake Butternut Squash Bread. In November when we are thinking of & planning our Thanksgiving Day & menus for that weekend, most consumers purchase the cans of canned pumpkin located in very visible displays in our grocery stores. I don't purchase them. As I mentioned in my previous post, my family always had a large garden when I was growing up. The Butternut Squash we harvested was always enjoyed as a veggie at dinner and also in quick breads. 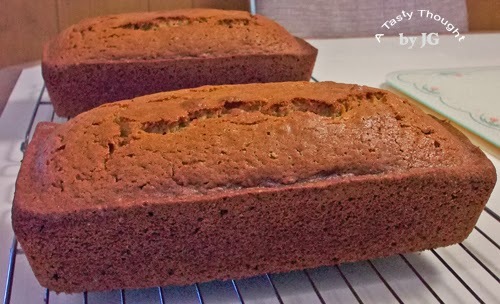 You know, those breads where the ingredients are mixed together quickly in a large bowl and then baked in a loaf pan. They are quick! They are easy! They are yummy! Butternut Squash has a great flavor. It is not bland and it's a wonderful ingredient to use rather than pumpkin in many recipes! I always bake 2 Butternut Squash Breads - one to enjoy now and the other is wrapped & placed in my freezer. Baking this bread now and freezing one loaf gives me a start on Thanksgiving! I use Egg Whites whenever possible when baking/ cooking, less Cholesterol. 2 Egg Whites = 1 Whole Egg. Olive Oil for sauteing & baking works very well here. The 2nd bread is wrapped in Heavy Duty aluminum foil/ labeled and placed in my freezer. Mashed Butternut Squash ready to place in freezer bags. The carton of Butternut Squash had been sitting on our garage floor for a good 2 weeks. It's location was just to the left of our entry into our Family Room. I sure could not miss it while glancing over - each time I went in or out of the door. The squash that had been purchased at Meadowbrook Farm in October would be prepped to enjoy this month and also for our freezer to eat later. This "project" has become a tradition. Butternut Squash is just delicious after it has been cooked. No sugar nor spices are needed to enhance the taste! While growing up, my family always raised this veggie and froze it. Living in an apartment so many years ago in Hampden, MA, my DH & I had a large veggie garden. Our landlord knew of my desire to grow our veggies, so he plowed a section of his rich soil side yard for us to plant our crops. It was great! That was all B.C. = Before Children! Time moves on! Now, I purchase the local fresh veggies when they in season and continue to freeze them. 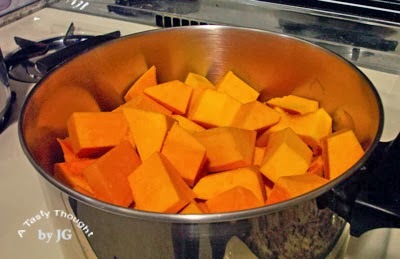 Rinse/clean the Butternut Squash under cold running water. After a Boil is reached, lower the heat and simmer about 13 - 15 minutes, until pieces can be pierced with a fork. 15. Cool until comfortable to pack in Ziploc Freezer Bags. 16. 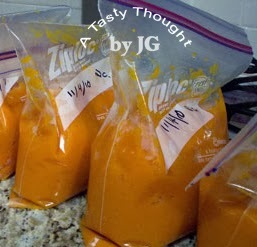 Pack about 2 Cups of mashed Squash in Ziploc Freezer Bags. 17. After labeling, store in freezer. Whenever Butternut Squash is desired for dinner, a bag is unwrapped. 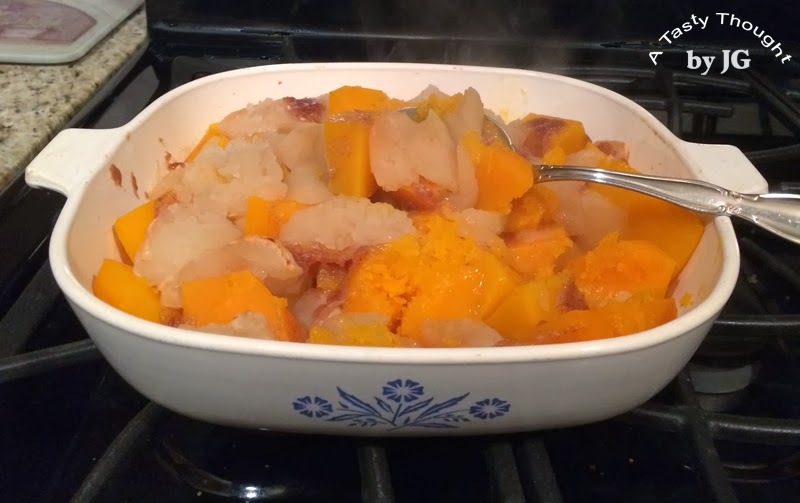 The frozen chunk of squash is placed in a Corning Ware container with a lid. Reheat in the microwave. No Butter/ Margarine or spices are needed. Do you serve Butternut Squash? Have you frozen it? It's very tasty!